The Acropolis is located on a rocky outcrop overlooking the city of Athens. (It is a pretty steep walk!) There are several ancient structures at the Acropolis including the Parthenon, the Odeon of Herodes Atticus, the Propylaia, the Erechtheion, and the Temple of Athena Nike. 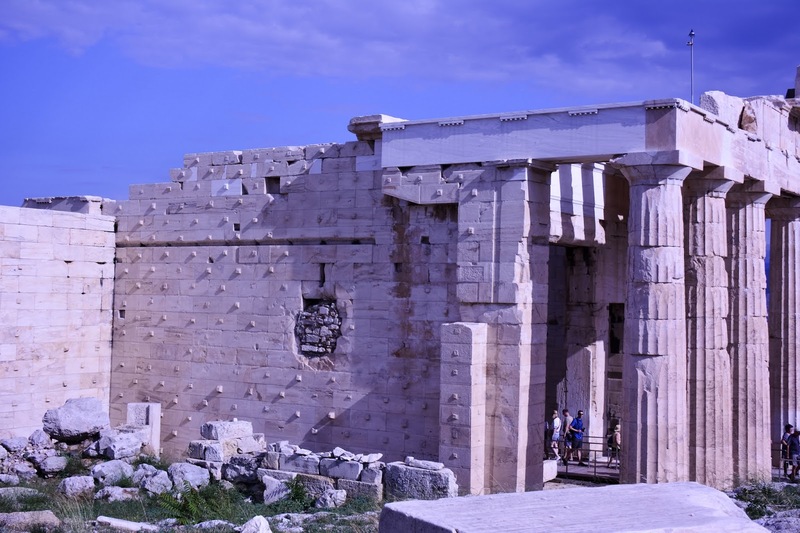 Archeologists believe that the Acropolis dates back all the way to the 6th century BC. Above is the Parthenon. The Parthenon was originally a temple dedicated to the Goddess Athena, the patron of Athens. The temple was known as “the temple of the virgin goddess”. 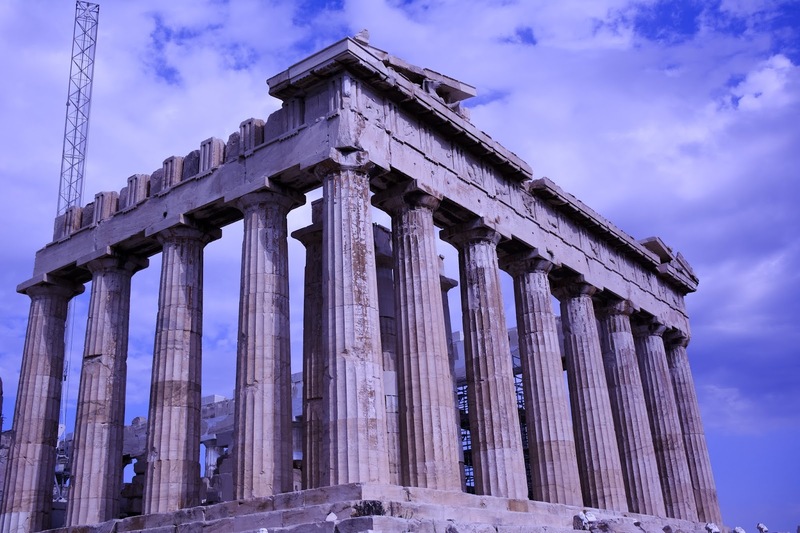 The building of the Parthenon began in 447 BC and was completed in 432 BC. It is known as the most important classical building in all of ancient Greece. 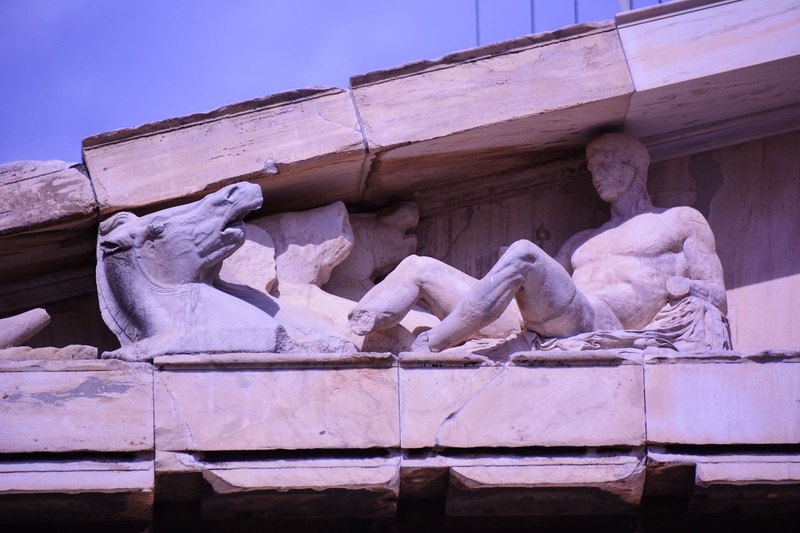 Amazingly, the sculptures on the east pediment of the Parthenon are still mostly intact. The figures on the corners are Tethrippa of Helios and the horses of his chariot. They are shown ascending into the sky at the start of the day. When walking up to the Acropolis, the first area that you pass is the Odeon of Herodes Atticus. It’s located on the southwest slope of the Acropolis. 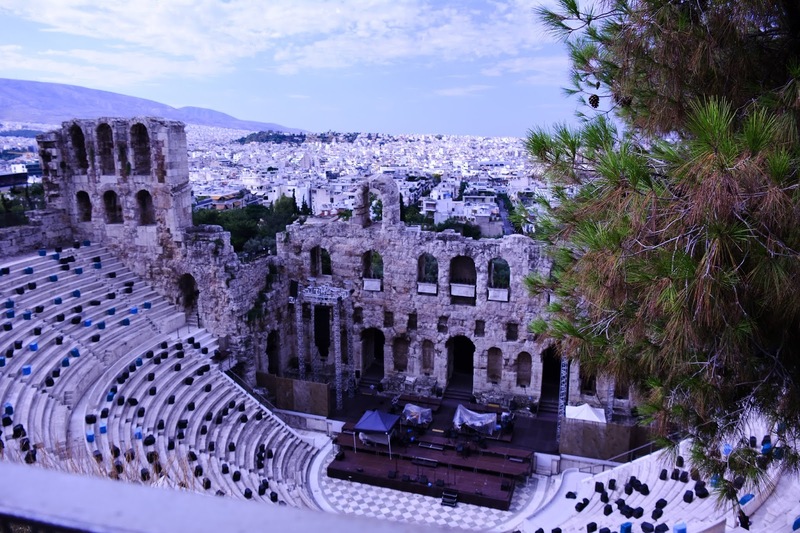 In 161 AD, Herodes Atticus built this theatre in memory of his wife. The theatre could hold up to 5,000 people. It was destroyed in 267 AD. The Propylaea is the entrance or “gateway” to the Acropolis. It was built between 437-432 BC. It was never finished. There were originally five gates into the Acropolis. Supposedly, people who were “unclean” were stopped at the Propylaea and not allowed into the Acropolis. 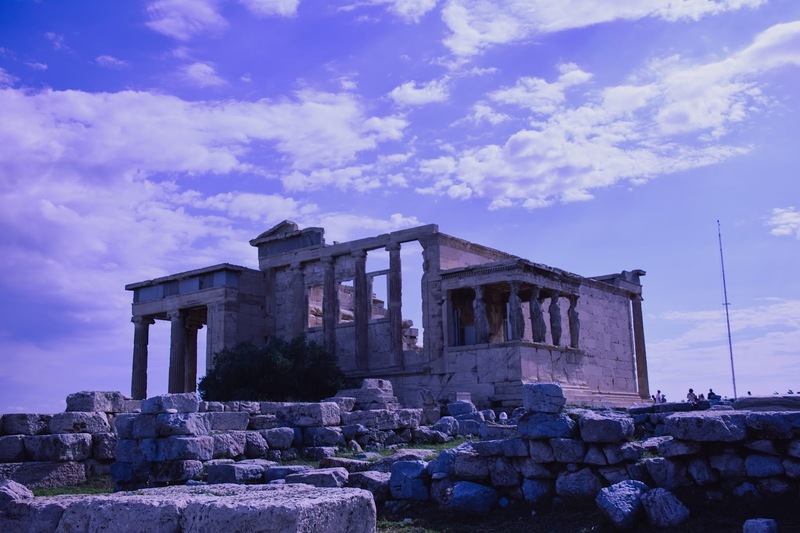 The Erechtheion is also a temple at the Acropolis built for the legendary Greek hero Erechtheius and dedicated to the Goddess Athena and the God Poseidon. It was built between 421-406 BC. 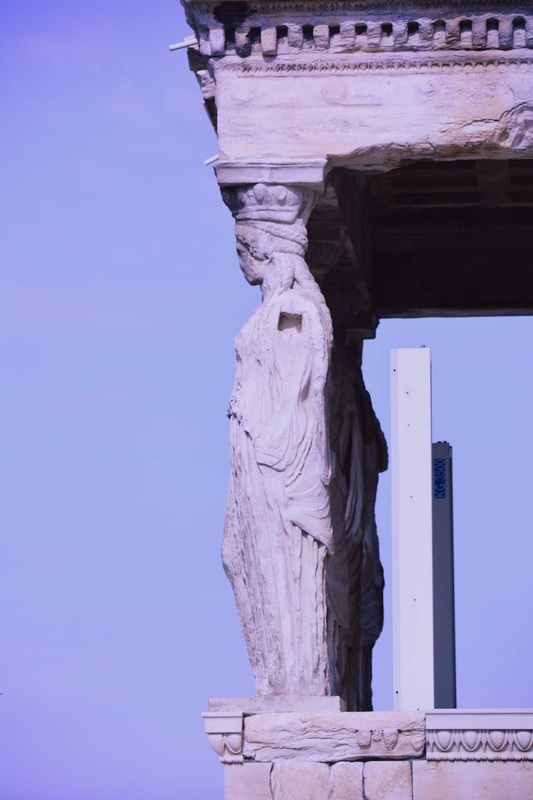 On the south side of the Erechtheion is the famous “Porch of the Maidens”, or “Porch of the Carytids” with six draped female figures (caryatids) as supporting columns. This building was rebuilt after the Peloponnesian war. The “maidens” are actually replicas, with the original “maidens” (5 of 6) located in the Acropolis Museum. 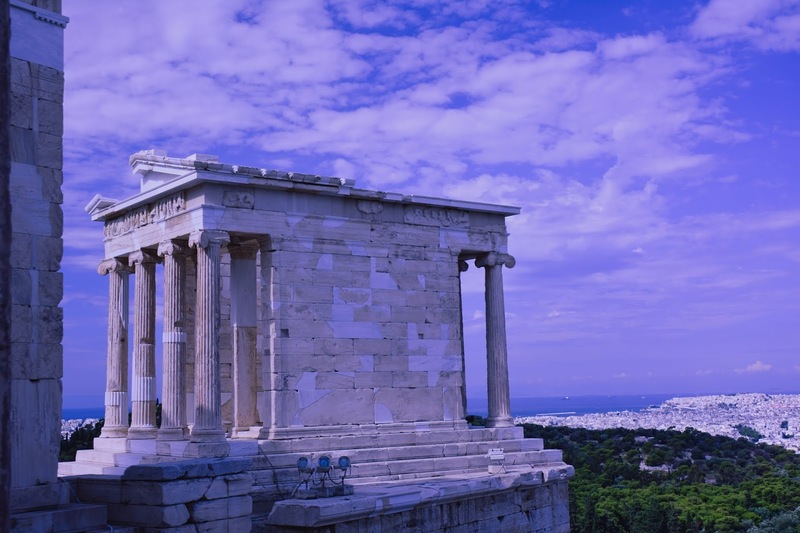 The Temple of Athena Nike is a temple dedicated to the Goddess Athena Nike. It was built around 449-420 BC. Nike means “victory” to celebrate the Goddess Athena in war. We enjoyed the Acropolis so much and it was absolutely amazing to see ancient structures up close and personal that I have read about my entire life. I hope that you have enjoyed this piece of Athens and I can’t wait to share more with you soon.